Choosing your wedding ring can be a pretty daunting task, especially for men who have little experience in wearing jewellery and are often unsure of what they would like. Before I get into the technical bit (metal choices, styles, etc.) the most important piece of advice that I can give you is don’t leave it until the last minute! With all of the jobs that need to be ticked off the list, wedding rings are often one of things left until last – just remember the one thing that you will take from the day forever (apart from your spouse!) is your ring. Forget about favours, flowers and seating plans for one day and take the time to choose the perfect ring for you. The first question when it comes to metal is colour. Do you prefer yellow, white or rose or maybe you would like a combination of two. Once you have decided the colour you have to choose which metal suits your lifestyle and budget, here is a list of the choices by colour. To read more about the various metals visit our Metal Choices page. The next decision is the profile of the ring – whether you like a flat very engineered looking ring or a softer curved ring. There are lots of choices of profile so try them all before making a decision. No matter what shape you choose for the outside of the ring, we would always recommend a curved profile on the inside of the ring. Better known as a comfort fit, it does exactly what it says on the tin! The most common width for a man’s wedding ring is 5mm but they can be anything from 3mm to 12mm. You won’t know what ring suits your hand until you try the various options but don’t assume that a larger hand will need a wider ring. Quite often a very wide ring on a big hand can look bulky and a narrower ring is a much neater choice. Remember when considering the width of your ring that it has a huge impact on the price. Rings are priced based on the weight of metal so the wider the ring, the more metal needed, the more expensive it becomes. This is less of a concern in titanium or 9ct gold but has a very big impact in the more expensive metals such as 18ct gold and platinum. You might just want a very simple ring but if you would prefer a little detail you can now choose the finishing touches. Whether you prefer a groove, a pattern or a texture, there are lots of possibilities. Above are a few of the many styles available to you – call in store to see the full collection. It is important to wear the same metals together as a harder metal can wear a softer one down over time. You can mix colours (an 18ct white gold engagement ring with an 18ct rose gold wedding ring for example) but you shouldn’t mix metal types. Diamonds can look beautiful in a wedding ring but make sure that it complements your engagement ring and doesn’t take from it. In 99% of cases less is more! If a straight edged wedding ring doesn’t sit perfectly beside your engagement ring you can have a ring made to fit perfectly with it. Consider how the wedding ring will look without the engagement ring in this instance. A shaped band may tie you into wearing the two rings together which is something to be aware of. It is so important to like your wedding ring as a stand-alone piece and not just as a set. Try it on its own and make sure you love it. You might not wear your engagement ring every day of your life so a pretty wedding ring allows you the choice to wear both or either. 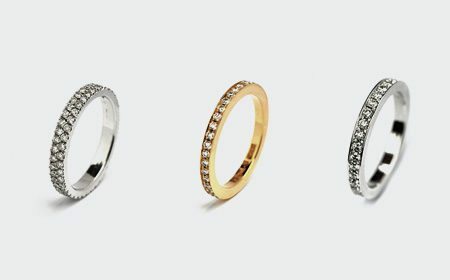 As you can see there is lots of choice when it comes to finding your perfect wedding ring. You can browse our collections here or call in store to try them on and we’d be happy to advise on the best choice for you!